Above: Atyunpe standing proud now! Bottom: As he was. 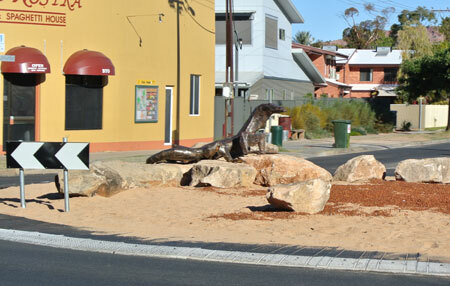 The roadsigns previously obscuring Dan Murphy’s sculpture on the roundabout at the intersection of Undoolya Road and Sturt Terrace have been repositioned. This allows an excellent view of the large monitor lizard – Atyunpe in Arrernte – rearing up at the top of the rise as you come off the Wills Terrace causeway or standing watchful guard as you go in the opposite direction. You also get an unobstructed view (left) approaching from north and south along Sturt Terrace. The road signs are situated now opposite each corner. They are low enough to be un-intrusive on the view across to the roundabout for an adult pedestrian; perhaps little people might need to be lifted up or taken closer. You would think the department putting up signs around town would think a little further than just plonking signs around town. Thank goodness it has finally been fixed. Have you noticed how hard street signs posting are to find? They are there, all different font sizes, usually too small for the traveler in the car, and some on one side of the road, and some on the other side, as you try to find the street you need to turn into. Look at the Kurrajong Drive sign partly hidden behind a power pole.